HyperX presents the HyperX AMP stand-alone USB sound card for the HyperX family of gaming headsets. The HyperX AMP USB sound card will enhance sound quality to any wired gaming headset with an upgrade path to include stereo and 7.1 surround sound. The HyperX AMP also packs technology that’s 10 times faster than the previous generation along with advanced microphone noise cancellation for clearer audio recording. 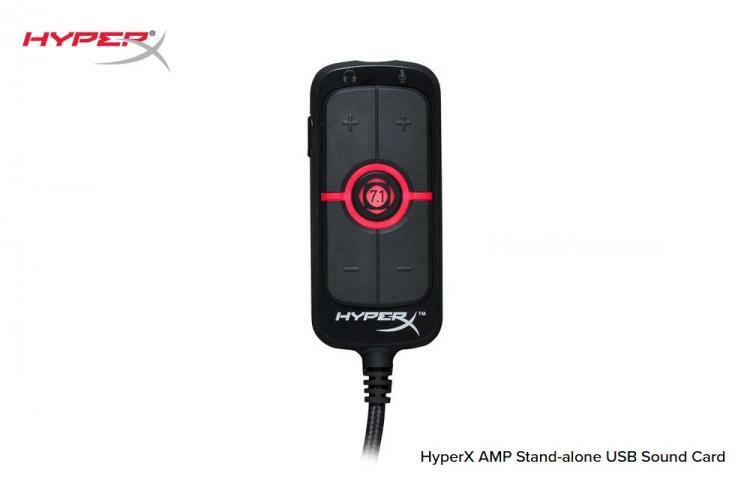 The HyperX AMP USB sound card has been tested and verified to work with the HyperX family of gaming headsets including the HyperX Cloud, HyperX Cloud II, HyperX Cloud Stinger, HyperX Cloud Alpha and HyperX Cloud Revolver. The HyperX AMP features audio and microphone volume control, premium 7.1 surround sound and microphone mute control. The HyperX AMP does not require any driver or software installation, simply plug and play. It comes with digital sound processing capabilities that enhance the microphone sound quality for clear communication while chatting. The HyperX AMP is built for professional gamers and casual users that want to upgrade audio quality of their headsets from stereo to digital 7.1 surround sound. The HyperX AMP uses a standard USB-A connection and supports a four-pole CTIA plug. The HyperX AMP USB Sound Card is now available in the US and Canada region with an MSRP of $29.99. Other regions to follow. Learn more about the HyperX AMP and other accessories here.